Family AcroYoga is the practice of AcroYoga with children and their parents (or an adult friend/family member). 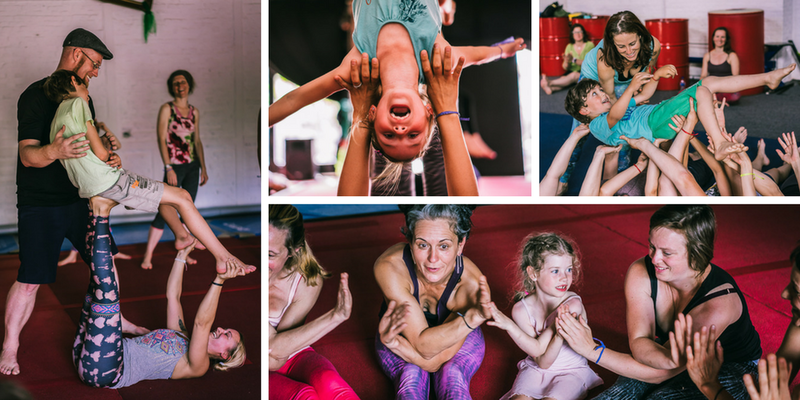 Yoga, acrobatics and thai massage come together to offer a world of possibilities for families to play, bond, connect with their bodies and take care of each other. Family AcroYoga creates bonding through movement, playfulness and joy. With the practice of these disciplines we aim to help develop confidence, trust in each other, and to teach communication skills that everyone can apply within their own family inside and outside of class. We believe everyone can fly! As AcroYoga Teachers we developed Family AcroYoga to stimulate playfulness and bonding and clear communication with the joy of physical movement for small families or large mixed age group settings. Esther, Tatjana and Mireia are three certified Acroyoga teachers that each in their own way and in own area started to teach AcroYoga to families, developing their own style and practice. In 2016 they came together to create the Family AcroYoga practice. Their diversity has been very valuable, realizing the more ways and styles they learn the richer the Family AcroYoga practice will be. In June 2017 the trio taught the first Family AcroYoga teacher training in the world. Now there are 15 more Family Acroyoga teachers spread out over the world. Mireia Castellsagué. Started practicing yoga when she was 21. Has been teaching kids and adults since 2006. She is a special education teacher and waldorf kindergarten teacher and has been teaching Yoga for kids trainings since 2012. Became an acroyoga teacher in 2010 and has been passionate about practicing and sharing the practice ever since. Mireia is teaching and organising retreats in OM SHANTI. Read more here. Esther Hertog. Since 1997 she’s been teaching children in different settings with great pleasure, and she started training in AcroYoga in 2006. In 2010 Esther became both certified as a Vinyassa yoga teacher and as an AcroYoga teacher. She was one of the first in the world, since 2009, to teach AcroYoga to parents and kids. Read more about Esther here. Tatjana t’Felt. She loves AcroYoga and she loves kids and families. So this is the combination that made her develop Family AcroYoga in Belgium. Tatjana is a certified AcroYoga teacher. She has been teaching yoga, movements and dance for many years. Tatjana has also been teaching Astanga Yoga in Copenhagen for seven years. Becoming a mother, she devoted her classes and interest to kids. She has been teaching kids and parents classes in capoeira and gymnastic. Tatjana lives and teaches in Brussels, Belgium. You can follow Tatjanas workshops and classes here on Facebook.